Holy week is a very important time for me, and I hope that you feel the same way. I’ve only seen The Passion once, and yet the images I can still recall from that single viewing have fueled many mediations. I hope that this year I can once again truly enter into the Passion with our Lord and through that understand the seriousness of my sin. I carry a prayer book in my purse, along with a rosary. However, since my purse is usually a disorganized mess, stuffed with anything from sippy cups to makeup to crackers to scissors, my prayer book is often damaged and I have gone through several rosaries. Therefore, it was high time that I made a little bag, one small enough to fit in my purse yet big enough to contain a prayer book and rosary. What is more, I had the joy of traveling to Rome with two of my sisters back in college. John Paul II was still alive then, and we were blessed with the opportunity to go to several papal masses, including midnight mass on Christmas Eve and mass on the Epiphany. If you have ever been to a Papal mass, you know that they hand out program booklets filled with BEAUTIFUL art work. I kept all of those books…but what do you do with them? What good is artwork in a book you never look at? So, I was delighted to have an opportunity to use the art in a way that will hopefully lead to reflection. First of all, cut your fabric to desired size. Then, press the picture onto the fabric. I knew I was making this into a little bag, so I placed my photo in the upper left corner so there was plenty of fabric to fold around and make a bag. Allow to dry completely. When totally dry, take a wet rag and allow the water to soak through the paper. Then, gently rub away the paper. The image will remain. Keep working! This takes a little time. Also, this will look “aged”, meaning, the transfer will not be perfect. Then, fold the fabric around and head to the sewing machine to stitch up the sides and create a bag with an open top. Next, take a ribbon and thread it through the top as pictures. I just used a scissors to poke larger holes through which I threaded the ribbon. As a final step, I added one big bead and ten little beads to one end of the ribbon–you know, just in case I loose my rosary! I’ve got the bag–now there is no excuse. Time to get serious and truly enter into Holy Week! I hope your Holy Week is fruitful and holy too. 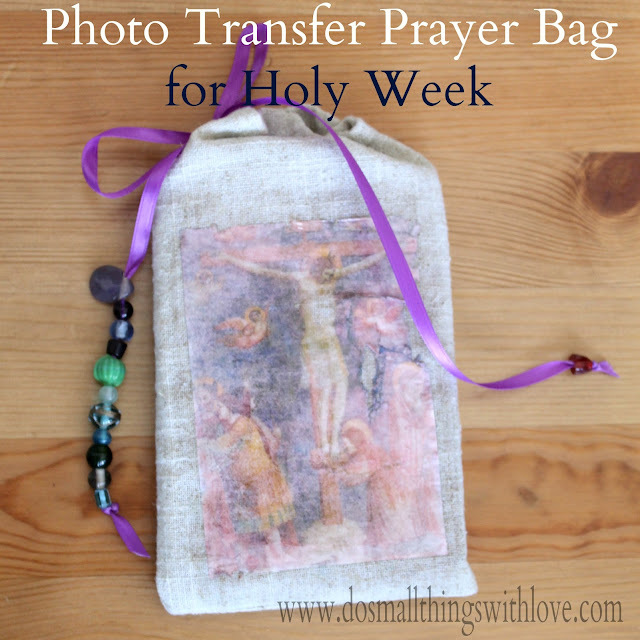 If you have any projects for Holy Week, I’d love to see them! HELLO! CAME ACROSS YOUR WEBSITE WHEN LOOKING FOR WASHER NECKLACES. LOVE! CAN YOU SUBSTITUTE MOD PODGE MAYBE FOR THE TRANSFER GEL? I DON’T HAVE TRANSFER GEL. THANK-YOU!!! I’m afraid you need transfer gel. sorry! I’ve never photo transferred on fabric before! Love your prayer bag idea! My stuff gets lost in my purse too-especially the rosary which manages to get stuck in a corner. A bag would be great for keeping everything easy to find and switch to another purse. I really love the 10 beads on the bag–for just in case! 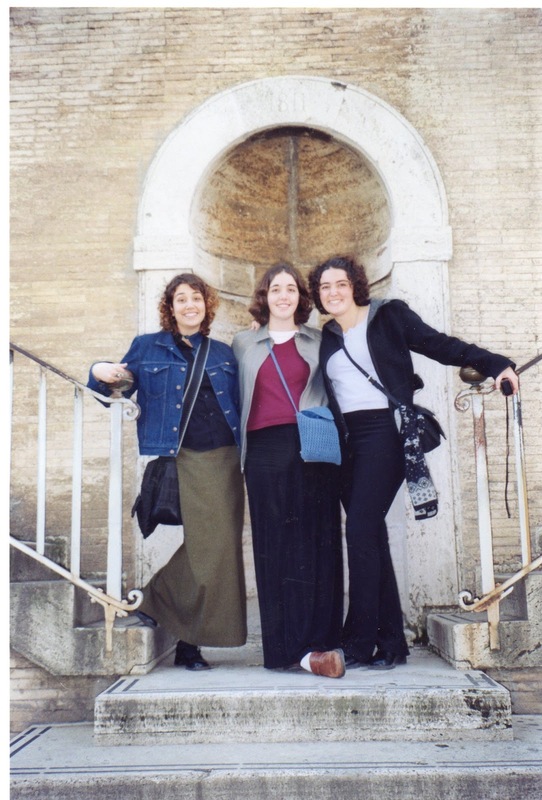 Great picture with your sisters in Rome. I’ll be going myself for the first time in June! So great hearing from you–Enjoy Rome! Such an amazingly CATHOLIC city!